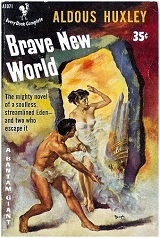 Huxley is remembered for his classic dystopian novel Brave New World. This novel, written in 1931, along with Orwell's classic 1984, have seldom been equaled. Unfortunately, due to the Mickey Mouse Protection Act, this novel is still under copyright and not freely available in the U.S. However, there was a radio adaptation by CBS Radio Workshop that is available.